This article is about the British magazine covering computer and video games. For the American magazine, see Computer Games Magazine. Computer and Video Games (CVG, C&VG or C+VG) was a UK-based video game magazine, published in its original form between 1981 and 2004. Its offshoot website was launched in 1999 and closed in February 2015. CVG was the longest-running video game media brand in the world. Computer and Video Games was established in 1981, being the first British games magazine. Initially published monthly between November 1981 and October 2004 and solely web-based from 2004 onwards, the magazine was one of the first publications to capitalise on the growing home computing market, although it also covered arcade games. At the time of launch it was the world's first dedicated video games magazine. The first issue featured articles on Space Invaders, Chess, Othello and advice on how to learn programming. The magazine had a typical ABC of 106,000. Launched in August 1999, CVG was one of the UK and Europe’s leading gaming web sites. Primarily known for its news service, CVG also features a mix of current and next-generation multi-format gaming reviews, previews, features and interviews, as well as a new emphasis on video and multimedia content. CVG was originally owned by EMAP, before being bought by Dennis Publishing. In 2004 CVG was acquired by Future Publishing who remain its current owners. In 2006, the site underwent a major re-design and relaunch to bring it up to scratch for the so-called next generation of Xbox 360, PlayStation 3 and Wii gaming. In 2007, CVG became the hub of a new CVG Network, hosting magazine sites for all of Future Publishing’s unofficial gaming magazines including PC Gamer, PC Zone, Xbox World 360, PlayStation World, PSM3 and NGamer as well as long standing cheats site, CheatStation. The CVG Network expanded further in May 2007 to include sites like Xbox 360 Magazine, Edge and Next Generation.biz. CVG also has a very popular forum with many users and topics. CVG has also had a cult following with an award thread they used to run known as the yakkies. In May 2007, CVG submitted to electronic audit by the Audit Bureau of Circulation and registered 1.56 million monthly unique users and 11.4 million page impressions. Future has since incorporated the forums of many of its other games related publications to ComputerAndVideoGames.com in addition to devoting sections to those that did not previously have a formal website, such as PC Gamer. In early 2014, CVG, amongst other Future-operated websites, was earmarked for closure by management, but instead received staff cuts in July. Future announced the closure of the website in December 2014. The website closed on 26 February 2015, with all pages redirecting to Gamesradar+, another Future publication. Until the closure of CVG, their official YouTube channel provided a variety of video game related content, providing everything from walkthroughs of games to news regarding video game consoles and regarding gaming events. Their second longest running series, GTA V O'clock covered news and conspiracy theories regarding Rockstar Games' Grand Theft Auto V and Grand Theft Auto Online. It was one of the few publications invited to see and play Grand Theft Auto V before its release to the public on 17 September 2013 and re-release for PC on 14 April 2015. When the magazine did reappear it was in a new form, titled CVG Presents, on 16 April 2008 with a bi-monthly release schedule. The new format concentrates the whole magazine on a single subject. 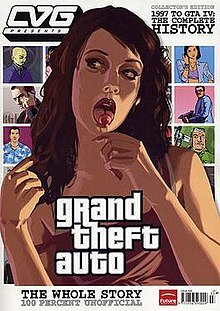 The first issue of the new format concentrated on the history of the Grand Theft Auto series of games. CVG Presents has not been published since 2009. CVG hosted the annual Golden Joystick Awards, the longest running gaming ceremony in the world and widely acknowledged as one of the most prestigious, as they’re voted for solely by the general gaming public. Originally created in 1982 as the CVG magazine's annual awards ceremony, the awards moved onto the web with CVG.com in 1999. In April 1983, the magazine published the results of its first Golden Joystick Awards, along with pictures from the ceremony in Berkeley Square. DJ Dave Lee Travis presented the award for best game of the year to Jetpac. The 2006 Golden Joystick awards attracted over 540,000 votes and were webcast for the very first time. The Golden Joystick Awards entered their 25th Silver Anniversary year in 2007 and attracted over 750,000 votes from gamers around the world, with Microsoft's Gears of War winning four Joysticks including Ultimate Game of the Year. ^ Tuukka Taarluoto (Fall 2007). "Writing Games. A Study of Finnish Video Game Journalism". University of Tampere. Archived from the original on 11 June 2016. Retrieved 2 June 2016. ^ Lee, Dave (21 May 2014). "Computer and Video Games online magazine facing closure". BBC News. Archived from the original on 2 October 2016. Retrieved 27 September 2016. ^ "Future will close CVG". MCV. 1 December 2014. Archived from the original on 1 December 2014. Retrieved 1 December 2014. ^ Di Hand; Steve Middleditch (10 July 2014). Design for Media: A Handbook for Students and Professionals in Journalism, PR, and Advertising. Routledge. p. 8. ISBN 978-1-317-86402-8. Archived from the original on 3 June 2016. Retrieved 2 August 2015. ^ "The new CVG site - .net magazine". 9 January 2007. Archived from the original on 6 December 2010. Retrieved 21 May 2014. ^ "Computer & Video Games returns to the newsstand « Future PLC". Futureplc. Archived from the original on 3 November 2013. Retrieved 21 May 2014. ^ Plunkett, Luke. "The World's Oldest Video Game Publication Is Closing [UPDATE: Maybe Not?] Archived 23 December 2014 at the Wayback Machine" Kotaku. 29 May 2014. ^ Brook, Stephen (4 April 2008). "World's first gaming mag revived". The Guardian. Archived from the original on 4 November 2013. Retrieved 21 May 2014. ^ "Archive - Magazine viewer". World of Spectrum. Retrieved 21 May 2014. ^ "Games website CVG faces closure as part of drastic Future cuts". MCV. Archived from the original on 10 July 2014. Retrieved 8 July 2014. ^ "CVG saved but at a cost". MCV. Archived from the original on 14 July 2014. Retrieved 8 July 2014. ^ "PlayStation 4: News and gameplay - YouTube". YouTube. Archived from the original on 13 February 2017. Retrieved 7 February 2017. ^ "Xbox One: News and gameplay - YouTube". YouTube. Archived from the original on 13 February 2017. Retrieved 7 February 2017. ^ "E3 2013 - YouTube". YouTube. Archived from the original on 13 February 2017. Retrieved 7 February 2017. ^ "Wednesdays: GTA 5 o' Clock - YouTube". YouTube. Archived from the original on 13 February 2017. Retrieved 7 February 2017. ^ "GTA V O'clock goes hands on with GTA 5 on PC - 'It's the definitive edition'". gamesradar. Archived from the original on 6 November 2016. Retrieved 7 February 2017. ^ "News: CVG Magazine returns!". ComputerAndVideoGames.com. 3 April 2008. Archived from the original on 24 May 2010. Retrieved 21 May 2014. This page was last edited on 28 March 2019, at 13:39 (UTC).